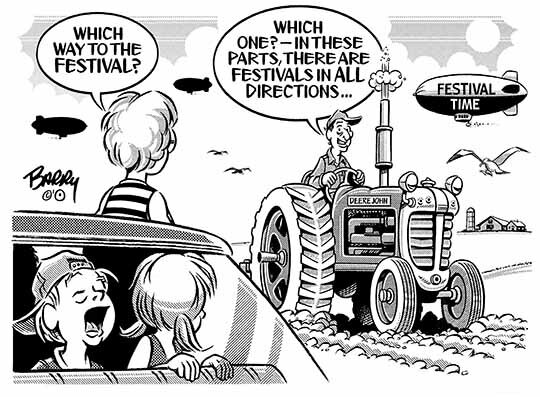 Only one FESTIVAL cartoon attached today. BUT, it comes with myriad localized variations — hopefully, including your own FESTIVAL! PLEEEEZ NOTE: If you don’t find your unique annual FESTIVAL among those posted, let me know what you call it, & I’ll add it to the list — that is, I'll add it as soon as I get this week's LABOR/LABOUR DAY finished. My, oh, my — how crowded things get for your 'toonist at this time of year! P.S. Whenever I can catch my breath, I'll upload a FESTIVAL Toon Category with more cartoons on the topic — just don’t hold your breath, 'kay? HA!